Who needs roses? To celebrate their 60th year, Canter&apos;s Deli will be offering their famous corned beef sandwich on rye, pickle, "taste" of potato salad and a chocolate rugelach for only 60 cents! It is one per customer, but that&apos;s OK. You can just bring us a couple of black & white cookies. The 60-cent sandwich will be offered between 12 noon and 12 midnight today. If you are worried about long lines and traffic, Canter&apos;s can seat 465 people at a time. Marc Canter assured LAist that they are ready for the crush. We are set up to feed 7000 people from noon to midnight. 5 machines will be cutting hot Corned Beef and the Potato salad cups are all made up and pickles are sliced up and ready to go. Because we feed so many people so fast the parking thing is not a problem. Canter&apos;s was originally a family-run business in New Jersey, but in 1931 the Canter brothers moved out to Los Angeles, first opening in Boyle Heights. 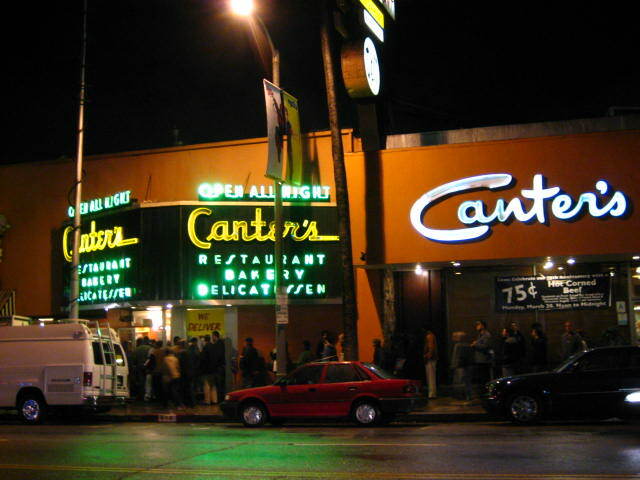 Canters celebrated the 75th anniversary of that auspicious occasion with a 75-cent sandwich in 2006. Canters relocated to The Miracle Mile in 1948, the date we honor today. Finally the deli found a permanent home in 1953 when the former Esquire Theater on Fairfax became the Canter&apos;s we all know and love (Especially at 3 o&apos;clock in the morning). So if you miss this one, it&apos;s only five more years until the next big anniversary. LAist asked Marc Canter about celebrating 60 years in Los Angeles. "LA is the best place in the World and we&apos;re happy that we have been open 24 hours a day for all these years. People depend on us like the train station, always open!!" Julie Wolfson contributed to this post.